You're currently reading a blog post. To go back to the post list, you can click Show all to see everybody's stuff, or a artist's icon to see just their blog posts. Gosh! Only three sleeps till MAICon! For anybody who hasn't heard, we'll be attending and sponsoring MAICon again this year (we're super pumped for this year's "under the sea" theme). Normally we try to write something up in advance, but we've been swamped. Making cubewhales, working on new designs, revamping old designs, making cubewhales, sewing cushions, making cubewhales and making cubewhales has kept us super busy! This year, you'll be able to find us just inside the main extrance to the trader's hall, which is located in the G Block gym (the Human Movement building on the Newnham campus map). If you're in Launceston and heading to MAICon on Saturday the 5th, be sure to drop by and say hi. Enough about that, let's talk cubewhales. If you haven't spotted, we've made some papercraft cubewhale templates available for you to download, print out, colour in and fold into your very own cubewhale. If you make one, we'd love to see (send a photo our way! ), or if you bring your cubewhale to our stall at MAICon this weekend, we'll give you a free badge! 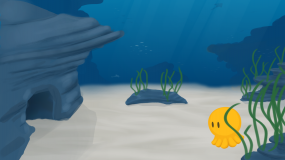 In addition to our usual con fare, we'll be showing off Above The Waves, a short game prototype we made earlier this year about a cute octopus that we are working on expanding into a full game later this year. We've also popped up a new website for Above The Waves that you can check out here. For cushion fans, we'll be launching two new sea flavoured designs. Continuing our fairy tale inspired series, we have "Girl In The Ocean", and to to keep our Vintage Cats and Dignified Penguins company, we are proud to present the Dignified Walrus. Both of these designs will be appearing on our site and RedBubble store over the next few days, but in the meantime, here's a sneak peek at some cushions being made by Mim! In addition to these two brand new cushion designs, we'll be bringing along the new-to-MAICon cushions we debuted at AICon earlier this year. Dapper Moon, Dignified Penguin, Space Cat as well as shaped Pear, Lemon and Orange cushions - so many new friends! In light of this year's theme, we went back and reworked a couple of our older pieces of artwork that we hadn't yet found time to do something with, such as Chubby Mermaid, Jellyfish and Tentacle Love. These will also be up on our RedBubble store in time for MAICon for anybody who can't make it but would love to grab a print, shirt or sticker. You can now love blog posts! If you like this one, click the heart icon!